Cancer cells deploy “drones” to battle with the immune system from a safe distance, research has shown. The biological weapons consist of tiny capsules, or exosomes, armed with a protein designed to block the activity of immune cells. 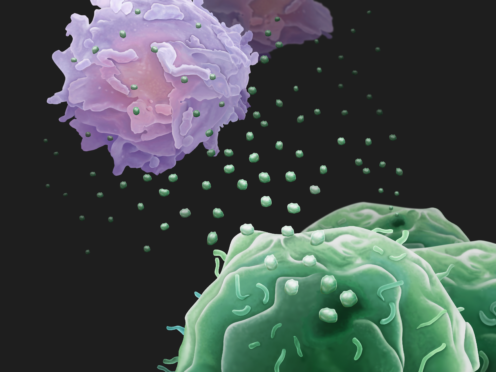 Released into the blood stream, the exosomes switch off “killer” T-cells that would otherwise target and destroy the tumour cells. Scientists made the discovery after collecting blood samples from patients with melanoma skin cancer. Professor Wei Guo, from the University of Pennsylvania, US, said: “Essentially exosomes secreted by melanoma cells are immunosuppressive. The team, whose findings appear in the journal Nature, found that breast and lung cancer tumours also released exosomes carrying the protein, PD-L1. Tumour cells flooding the body with PD-L1-carrying “drones” may explain why cancer patients often suffer a generally weakened immune system. Newly developed immunotherapy cancer drugs are designed to prevent PD-L1 deactivating T-cells, but do not work for all patients. Circulating exosomes may provide doctors with a way to track the effectiveness of the drugs, known as “checkpoint inhibitors”. Prof Guo said: “Just as diabetes patients use glucometers to measure their sugar levels, it’s possible that monitoring PD-L1 and other biomarkers on the circulating exosomes could be a way for clinicians and cancer patients to keep tabs on the treatments.